In combination with other chemical modelling tools and TPMS, Anaxomics uses docking to help biopharma companies to discover new targets and filter. 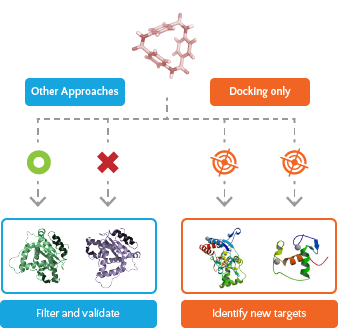 Molecular docking is an invaluable tool to assess drug-to-target interactions of your lead compound in a cheap, fast and reliable manner. Essentially, the aim of molecular docking is to give a prediction of the ligand-receptor complex structure using computation methods. In a docking assay, molecules possessing complementary shapes interact with short-range non-covalent forces to form a tight reversible complex. A scoring function is used to evaluate the binding intensity of this complex, thereby providing an objective measurement of the affinity between ligand and receptor. 1) Discover new potential targets on the basis of their predicted interaction with the compound under study, by testing it against all the structures contained in PDB. 2) Filter and validate the potential targets identified through chemo-centric and target-centric approaches, by assessing the plausibility of their interaction with the compound under study. In this effort, structural flexibility of proteins and ligands must be taken into consideration, and that is why Anaxomics has set up molecular dynamics simulations. By discovering new off-targets, a target-centric approach may be applied to characterize the safety profile of lead compounds or as an essential step of drug repositioning. This method reaches its full potential when used together with a systems biology analysis as a part of the integrated solution developed by Anaxomics. Pharmaceutical companies can also take advantage from molecular docking to discover potential new targets for their lead compounds or to make early decisions about the compounds in their pipeline. You can read more about how we perform molecular docking on the corresponding White Paper.